In my last post I mentioned that I had a couple of reviews up my sleeve. Well, kind readers, the time has come. Just because I haven't blogged in a (weeny) while doesn't mean that I haven't been knee-deep in lotions and scrubs, trialing and testing them out for you. It's a tough job but someone's gotta do it. You may remember I did a post on the best-eye-cream-ever last month from the same company that sent me these. Naturally, I fell in love with these products too. 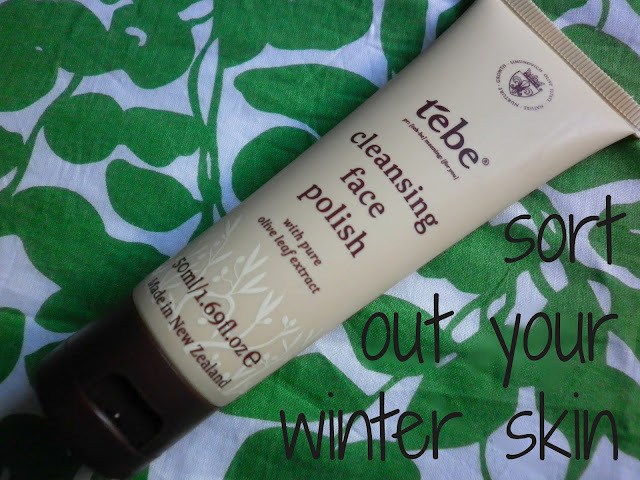 It's nearly spring and what better way to shed our dead winter skin than with this face polish. I've been using it all month to help me get rid of that dull winter look and add some radiance back into my skin. It contains finely ground Olive kernals and Kaolin clay to deeply cleanse and exfoliate the skin. The trick with exfoliators is to gently circle the scrub over the skin and let the beads do all the work. Not rub it in with such force as to scratch and irritate the skin. The Tebe Polish didn't do that, because I noticed that the Olive pips have been rounded so as not to scratch the skin (I'm not even going to get into some of those supermarket scrubs **St Ives!**). This polish gave me an excellent result and I attribute that to the fact that it contains lots of the 'resurfacing' ingredient, the Olive kernals. I found they didn't 'melt' on my skin like some exfoliators can, which just shortens the time you've got to work with the product. It contains nourishing oils like Sweet Almond and Olive which give a creamy texture and avoid that 'just-scrubbed-and-stripped-of-all-moisture' feeling. It also aims to remove blackheads and UMF Manuka Honey is on hand to help as an antibacterial for any of you suffering with a little acne. It has a great smell as well, which you all know is very important to me. If you want to get that spring glow that I'll be rocking, thanks to this product then you should definitely check this out. I don't know if I told you this, but I'm a lip balm devotee. When I was in intermediate my teacher would stare me down with her hawk eyes to catch me putting lip balm on and tell me off. Apparently I had quite the obsession and would hold a chapstick in my hand the entire day. Nevertheless, I still love this moisturising stuff we put on our lips daily, and this balm is no exception. I've actually used this one before, many moons ago (6 years) and I loved it. It's since had a packaging update (which I prefer) but the formula is still amazing. It's non-greasy, non-sticky, moisturises for hours and gives you sassy lips like a Victoria's Secret model. It's got an angled tip for direct application. No messy fingers here (unless you're taking a photo of it). Mid application. I was a bit snap-happy. Shame about the poor quality photos, it doesn't do this balm any justice. If you want something natural and moisturising that won't break the bank, go and get this stuff, you'll thank me later (when you're looking all VS with your Doutzen Kroes lips). Photo editing skillz at their worst. What do you think of these products? I'm really impressed with this brand and I'll look into buying more of their range. I've been told they're soon releasing a skin care oil to rival all skin care oils. I've seen the ingredient lineup and it's fierce! It will help with scarring, ageing, stretch marks, fine lines, uneven skin tone and dry skin. I'm so looking forward to it! In the meantime, something for you to look forward to..... I've got an Olive travel set to giveaway! Keep looking out for that it'll be up soon. Click on the pictures below to go to their website. Avec un ensemble de basket nike homme 2017 air jordan techniques Nike Air Max Traditionnel BW Dark Heavy Skies Azure Whitened Hommes Nike Air Max 91! Vous femmes floral nike air max 90 fleur de jasmin pouvez facilement effectuer correctement dans les aires de jeux. Avec toutes les air jordan femme bleu et blanc fonctionnalités supplémentaires que vous attendez d'un prix beaucoup plus élevé, mais c'est la chose, ces cortez nike fille deux nouveaux Kelty Child Carriers sont à peu près le même prix basket nike air max 1 essential rouge blanc que les anciens. Les muscles de certaines personnes étaient serrés en raison de courir fréquemment, surtout le acheter nike air max 90 pas cher veau.